While hiking (sweating!) along a forested walking trail near my home over the weekend, I came across several types of oak apple wasp galls on their namesake hosts. These unusual plant growths can range in size at maturity from 1/2 - 2" in diameter and are named for their resemblance to apples. The galls are constructed of leaf tissue that has been hijacked by a gall wasp (Family Cynipidae) to surround a single wasp larva located within a seed-like structure positioned at the center of the gall. The exact species of gall-wasp that is responsible for producing the oak-apple gall can be identified based on the gall's structure, size, color, and oak host. In general, there are two groups of oak-apple galls: those with internal tissue composed of a mass of white fibers radiating from the central larval capsule, and those with tissue that strongly resembles the flesh of an apple; it is spongy and juicy. Both types of galls are various shades of green while the gall-maker is developing but become light brown and dried out once the new gall-making wasp emerges. 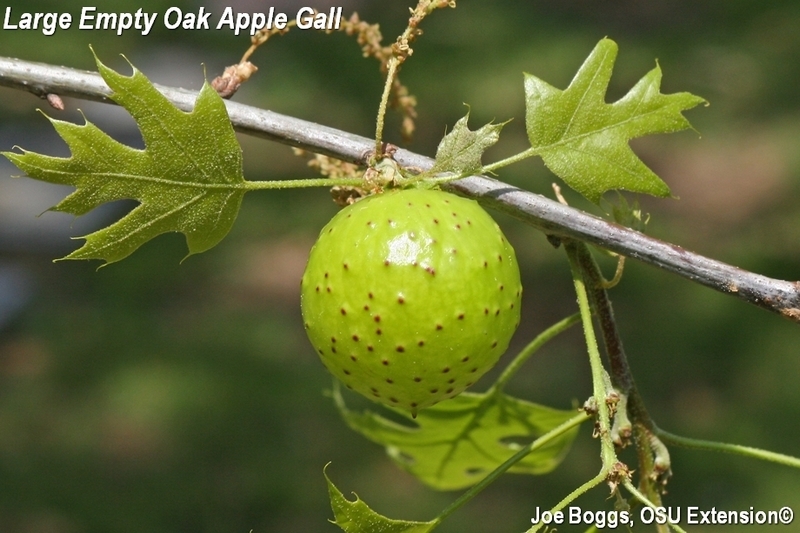 The so-called spongy oak apple gall is produced by the gall wasp, Amphibolips confluenta, on scarlet, red, and black oaks. The galls may be up to 2" in diameter and as their common name implies, the internal tissue is spongy and closely resembles the flesh of an apple. The surface of the gall is light green, smooth, and free of spots. The large empty oak apple gall is produced by the wasp, A. quercusinanis (syn. A. inanis). The gall is also found on scarlet and red oaks and measures up to 2" in diameter. However, the internal structure of this gall is composed of white fibers radiating from the central larval structure. The surface of the gall is light green and covered with purplish-red bumps.